I never intended to be a father. At least not as soon after the engagement as it happened. Maybe I should introduce myself first. I’m Joseph. You know, the husband of Mary, the mother of Jesus. The one who seems to be in the background of the Christmas story. In operatic terms, I’d be a spear carrier—a singer who has a couple of minor roles with a few lines, but mostly stands in the background as part of the scenery. I’m the person portrayed by the tallest Sunday School pre-school male, or the boy who can’t sing “Away in a Manger.” Or the Christmas pageant volunteer who can’t act, so the director has them stand beside the person playing Mary. But I’ll get to that in a few moments. Legends and myths have filled in the gaps left by the Scriptures. Some say I was a widower with children. Some say Jesus transformed wooden doves that I’d made for him into real birds. Some say I was more than 100 years old when I died. Whether legend, myth, or reality; spear carrier or integral part of the Christmas narrative, I was there when the babe of Bethlehem was born. Whether I was a widower or single, the time came when my parents felt that I needed to be married. I’d followed in my father’s footsteps and had also become a carpenter. But even that’s a bit of a misnomer, because the word you translate as “carpenter” has a broader meaning than one who makes tables or chairs. I was more of an itinerant artisan who could create everything from a table and chairs to windows and shutters. One legend supposes that much of my time was spent rebuilding Sepphoris, a nearby town that the Romans had destroyed. Whether you believe I was a widowed woodworker or a tradesman, the fact remains that I was gainfully employed and single. And it was time to take a wife. Again, it’s speculation, but chances are my family and Mary’s family knew each other. Nazareth was a small town and, like all small towns, it was difficult not to at least know of everyone, if not know about everyone. Mary was a young woman, not much older than a teen when we were introduced to each other. We went through the formal introductions by our parents and our engagement was announced. Even though it was an arranged marriage, as we got to know each other—during chaperoned meetings of course—we fell deeply in love with each other. I found her to be a sweet young woman who was entirely devoted to God. And, in the beginning, I thought she was the wife God intended for me. I was gobsmacked by the news. I know, now, how much courage it took Mary to tell me that she was with child. But at that moment all I could think of was how this was going to affect both my and my parents’ reputations. And it was hard to imagine how anyone in that small town would believe that we hadn’t sinned. The strange thing is, that as incredible as Mary’s story was—an angel announcing her pregnancy and that it was the spirit of the Most High who would overcome her and create the child—I believed her. I had no reason not to. But still. The practical aspects of being engaged to a now pregnant woman, with a child that wasn’t mine needed to be taken care of. If the synagogue leaders had any say in the matter, Mary would have been stoned as soon as the pregnancy became apparent. And, legally, I could have ended the engagement, claimed the dowry and had her shamed. But I loved her too much to follow the letter of the law. After a few sleepless nights, pondering her fate, I decided the simplest solution was to send her away until she had the baby. What would happen after that would be anyone’s guess, but it would, at least, save our reputations. If I’d found Mary’s tale of an angelic announcement incredible, then it’s difficult to find an adjective to describe mine. After deciding to send Mary away, as I slept that night, I too was visited by an angel, who affirmed everything Mary had said about the child being the Son of God and that it was my responsibility to care for both Mary and the child. In Nazareth. But then Caesar Augustus brought chaos to our peaceful life. It wasn’t as if we weren’t paying enough in taxes to the Romans when the emperor decided to find out if he was getting his rightful take. So he decided that everyone had to return to their ancestral home for a census. And here we were, with Mary only days away from giving birth when we found out we’d have to travel to Bethlehem—because I was fortunate enough to be a descendent of King David. I took the few extra shekels I’d been saving to buy a lamb for sacrifice after the child’s birth, and purchased a donkey. There was no way I was going to make Mary walk on what would have been a four-day journey for a healthy woman. I knew it would take longer for a woman in her condition. 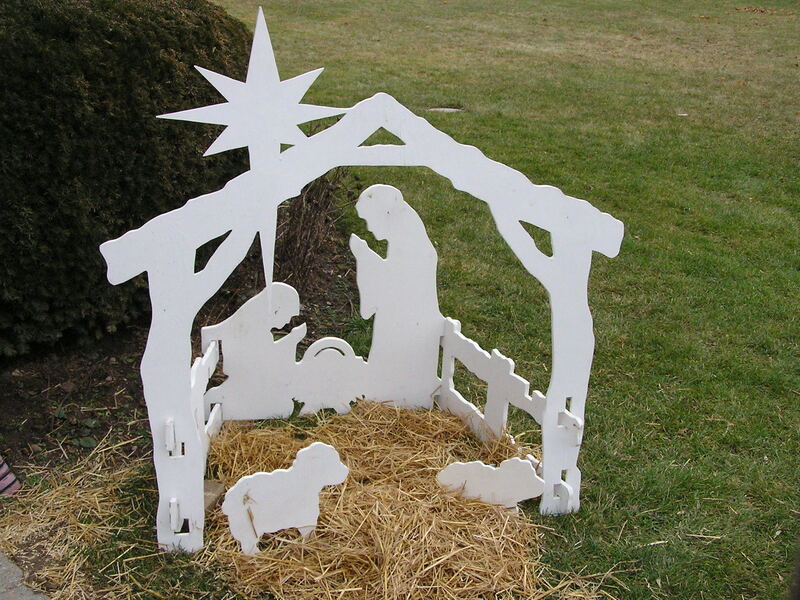 By the time we arrived in Bethlehem, every spare room had been taken. Those who ran inns had filled every square cubit, sometimes with more than one body. And those who had room in their homes, or on their roofs, made a few extra shekels renting the space out. We had nowhere to go. Finally, I came across an innkeeper I hadn’t yet met while getting supplies at the market. I explained our plight, but like everyone else in town, he had no room. But he did have an idea. He owned a small grotto the outskirts of town that he used as a manger. All he asked was a few hours to clear the animals and dung out and put out a few blankets and fresh straw for us and we could use it. I was desperate. Mary was so close to giving birth, that the grotto sounded like a palace. I took up his offer and by nightfall we were soundly ensconced in the manger. You probably know the rest of the story: Mary had the baby, angels visited the shepherds, the shepherds came to the manger and I stood in the background. And while the Bible says that Mary remembered every moment and treasured them, it’s silent about my reaction to that night. So. I’ll be silent as well. All I ask you to do is to imagine what any father would be doing under similar circumstances.